The financial crisis and subsequent economic hangover have caused restaurant and convenient store owners to deal with tremendous challenges. B2B e Trader is an essential tool that helps to give franchisees the kind of leverage they need to adjust to a host of economic problems through a number of unique benefits. This allows these businesses to more effectively adapt to changes that are occurring in the economy and with customer demand. A major issue that the majority of restaurants are dealing with is slowing sales from stagnant consumer spending. This is because of the lingering effects of the credit crisis on household incomes has caused most families to cut back on their expenditures. One of the first areas that have seen the largest reductions were in discretionary spending on items purchased at: fast food restaurants and convenience stores. This is having an adverse effect on the profit margins for a number of large franchises such as: Subway, 7-Eleven, Quiznos, Denny’s, Sizzlers and Bennigan’s just to name a few. In the majority of cases, franchise owners are receiving less assistance from their parent organizations in making their businesses work. This can create even more challenges on the individual store level, as the owner has to deal with the regular issues associated with running the restaurant or convenience store. Then, they have to somehow be able to compensate for the lack of support that is being received from company headquarters. The combination of these two factors can create a situation where many franchises have been forced to close. To prevent this from happening requires utilizing strategies and tools that will deal with these issues. How B2B e Trader is Helping Franchisees? 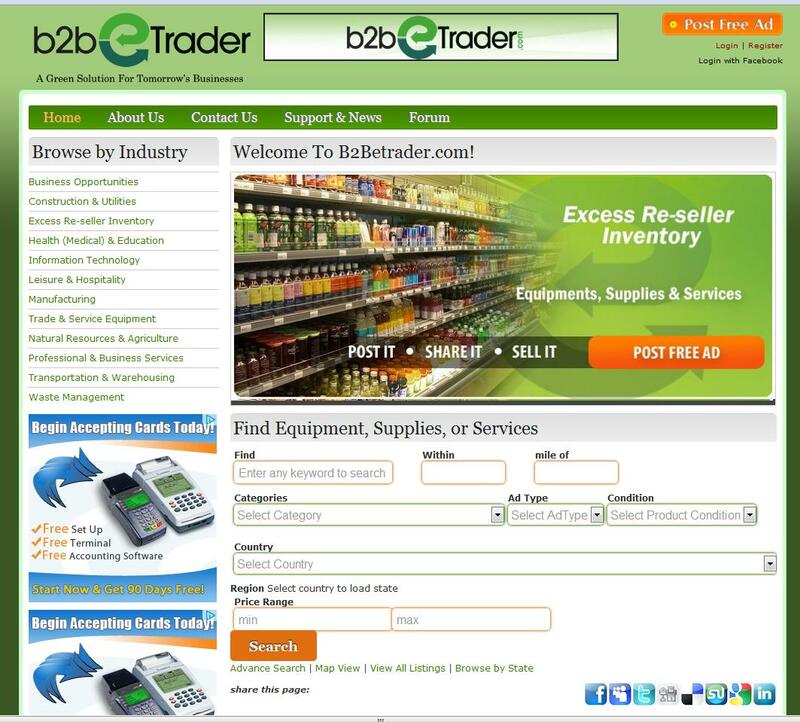 One of the more effective tools is to visit B2B e Trader on regular basis. This is because they specialize in directly placing buyers and sellers together in a customizable platform. In this case of restaurants and convenience stores, this means that there are significant benefits that this will provide to include: the ability to lower costs and exchange / purchase new equipment. When it comes to lowering costs, B2B e Trader has a unique platform that allows restaurant owners to compare prices among a host of suppliers. For the owners of fast food franchises and convenience stores, this can assist them in the finding right equipment they are looking for at the lowest costs. Over the course of time, the savings in these areas could help these kinds of businesses to have greater amounts of flexibility by: using this tool to reduce their expenditures on big ticket items. The exchange and purchase of new or used equipment, is the kind of options that are provided to business owners from suppliers. This is from B2B e Trader working with a wide variety of whole sellers. As a result, this can help franchisees to find the right equipment with those options that will work with their business. In a tough economy, this will assist these kinds of restaurants and convenience stores with to adjusting to the changes in consumer demand by having a number of options available to them. Clearly, franchisees are facing tremendous amounts of economic challenges from the slowdown in consumer spending. To deal with these issues, B2B e Trader can serve as one tool that will help owners be able reach out to suppliers by: comparing prices, finding the lowest costs and the best terms for purchasing any kind of equipment. This is when they will have greater amounts of flexibility in dealing with these issues. B2Betrader.com is a "free to use" business to business (b2b) re-marketing, classified and directory listing website. This website serves businesses and professionals that are looking to buy, sell, trade, and barter commercial assets and resources including equipment, supplies or services. It’s a one-stop marketplace for anyone to buy, sell, trade and barter everything from (tangible) products like machinery to (non-tangible) products like trademark patents and everything in between. Great for investors, start-up businesses, dealers, liquidators and companies' procurement professionals. B2Betrader.com is a smarter more focus re-marketing listing website that gives you the ability to place ads on an open market network based on industry use. It’s also a powerful centralized networking hub powered by all the major social media outlets and the “social-sharing” technology giving your listing maximum exposure and the maximum return on your investment. This website will be an important source for raising capital to help finance upcoming new projects or help with the maintenance of current infrastructures. It will ultimately help businesses operate more efficiently, and at the same time help the environment by reducing unnecessary waste.